Your Dreams Coming True In The Kitchen: Greek Independence Day March 25th 1821. Greek Independence Day March 25th 1821. Please read my posting on March 25th 2011. As known, Greece was under the Ottoman Empire from 1453 A.D. to 1821A.D. It was on Tuesday 13th ( no wonder why Tuesday the 13th is considered an unlucky day in Greece--something like Friday 13th) that Greece fell under the Ottoman rule. It was on March 25th that the Archangel Gabriel came to tell the Virgin Mary that she was going to give birth to our Lord Jesus Christ. Therefore this date is held in Greek history as the date that a priest by the name Paleon Patron Yermanos rose the Greek flag and said "That's It" no more Turks! It is also a custom that on this particular day Greeks eat fried Bakalao fish (salted cod) with a heavy on garlic paste made with a mixture of water soaked old bread, potato, lots of garlic, vinegar and extra virgin olive oil. Because I have stopped eating white bread made from wheat, I looked into the internet to find some other recipe to make this paste. All I had to do was to look at my own readers, only to find "Captain Cook" - Eri whose latest posting was how to make this garlic paste without using potato or white bread. So that is her solution to use barley rusks (very hard to the bite when dry but softer when soaked for 1½ minutes in water), wall nuts, garlic, and extra virgin olive oil and vinegar. I also wish to add that this time the Cod fish cakes were fried without the use of a batter, but using, flour, beaten eggs, and breadcrumbs. I say it now, two years later, that today's frying method was much better and somewhat healthier than the batter version. I could have of course baked them instead. Next time. - 1kg Cod fish cakes. - 2 cups Panko (Japanese bread crumbs, the one they use to make Tempurá). - 1 cup flour any kind you wish. - 2 eggs beaten with 1 tsp. onion powder, 1 tsp. dry tarragon, 1 tsp. ground green pepper, 1 tsp. sweet paprika. 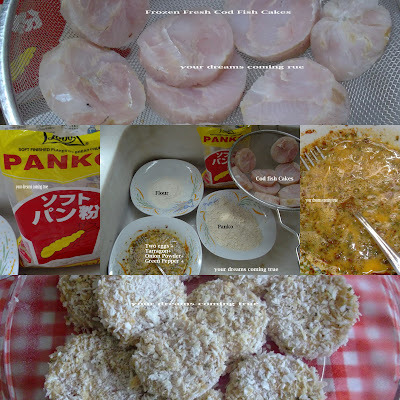 - Coat each Cod cake with flour, dip in egg mixture to coat well then finally coat with the Panko. - Refrigerate for at least one hour to render the cakes cold just before frying. - Fry both sides in fresh sunflower oil till golden, prick with a fork to see if cooked. Throw the oil away after frying do not use it again. - Lay on kitchen paper to get rid of excess frying oil. Sorry I forgot to take a picture: we were too much in a hurry to eat!! - Serve with my version of Eri's garlic paste. My version of Eri's garlic paste:Captain Cook.gr (just changed the quantities). - 3 Barley Rusks broken up and soaked in water for 1½ minutes then strain. - 4 Cloves of Garlic. - ¾ cup extra virgin olive oil. - 1 cup tap water. - Salt and pepper to taste. (I put neither). - ¼ cup Rice vinegar. - Put everything into a multi processor and make into a paste. - Taste and adjust flavor to your liking. - Put into a bowl and serve with the fish. golden and oilless. The best I have eaten so far.